Challenge: Can you sleep like the Indus River Dolphin? Home Amazing Fact Animal Kingdom Interesting Facts Nature Science Challenge: Can you sleep like the Indus River Dolphin? If humans lived in water, we would definitely be friends with dolphins. These adorable, charming creatures behave like us in many ways – they have been known to show empathy and caring, recognize their friends after 20-year gaps, and invent new ways of fishing. But if there’s one thing we will never be able to catch up with them on, it’s their ridiculously short naps. In the ocean filled with deadly predators, dolphins are one of the calmest creatures, and so need to be constantly on their guard. But there are other factors at play. Did you know that dolphins can’t breathe during unconsciousness? This means they can never have a deep, sound sleep. But they have a solution: dolphins can let only one-half of their brain sleep at a time, with the eye on the other side open. During such ‘unihemispheric’ sleep, the ‘awake’ hemisphere monitors breathing. They sleep this way for eight hours a day, in gaps, usually in groups. For safety, they even keep swimming while sleeping! 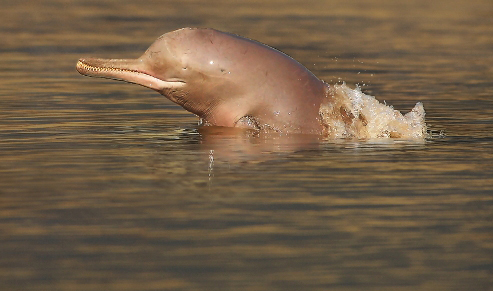 But the ‘blind’ Indus River Dolphin (Platanista gangetica minor), which navigates through its biological sonar, has it harder. Very few of this species still inhabit the Indus (Pakistan) and Beas (India). They can swim sideways, sometimes moving in water as shallow as 30cm. When it needs to breathe every 30–60 seconds, it rises to the surface, inhales, then rotates sideways again before returning below. But strong water currents and dangerous debris floating in the water means they need to swim continuously, so the Indus River Dolphin takes very short naps of just 4–60 seconds! This 100kg-heavy, 2.5m-long species has drastically died out due to poaching, water pollution, dolphin strandings in the Indus irrigation system, and habitat fragmentation – their original range has been divided into 17 sections by various dams. If we don’t act now, it might be too late.